Georg Brandes was the theorist behind what was known in Denmark as the modern breakthrough, which is the time in where, not only painting, but art in general, turned its course from the romanticism to the realism and naturalism. The old art began to seem forcedly aesthetic, polite and idealist. And, of course, it left aside what was real in nature and in men. The dane Harald Slott-Møller was a loyal friend of Brandes and that’s why he decides to portrait him in a series of lectures he gave in the University of Copenhagen. Personally, I do not enjoy much of this work. 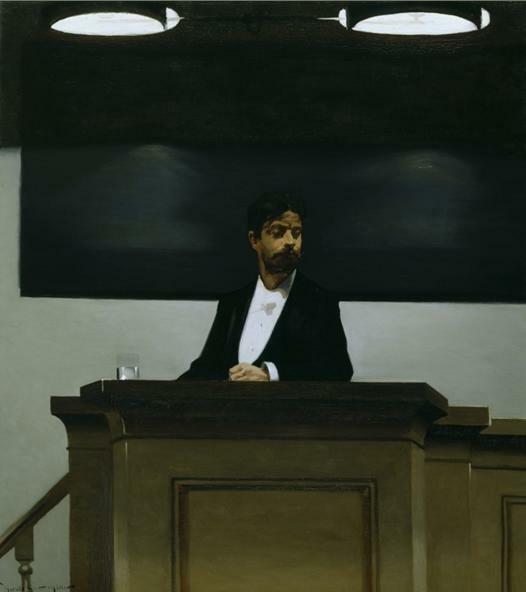 However, the handling of limited and simple colors is well achieved: the dark brown pulpit from which Brandes appears in black and white, making contrast with the beige all behind seems very effective. And also are the two upper lights that make contrast with the blackboard. As a whole, the painting works: the impression is of a serious Brandes, with authority but, at the same time, relaxed and comfortable. ~ by Álvaro Mazzino on July 8, 2010. This entry was posted on July 8, 2010 at 20:47 and is filed under Naturalism.You can follow any responses to this entry through the RSS 2.0 feed.You can leave a response, or trackback from your own site.